Our home town of New Orleans is called “The Big Easy” – perhaps because of the warmth of both our semi-tropical climate and our laid back hospitality or, as one legend has it, because it was an “easy” place for musicians and artists to pick up work while honing their crafts. Regardless of its origins, we at Corporate Realty know that achieving success in New Orleans, like anywhere else, is basically a matter of just plain hard work. When speaking of artists, musicians and Corporate Realty’s passion and theme, food, no one exemplifies the spirit of New Orleans and hard work better than Leah Chase. At 92 years of age, the queen of Creole Cuisine, and head chef of Dooky Chase’s restaurant can still be found every day either in the kitchen or greeting guests in the dining room of the restaurant where she has worked since 1946. While Ms. Leah is the quintessential restaurateur, her legacy extends well beyond her culinary accomplishments. She is a life-long advocate of African American artists and art – Dooky Chase’s Restaurant being the first art gallery for African American artists in New Orleans. At Corporate Realty, we also work hard every day to help people and companies with their commercial real estate needs. Our larger role, and one which we take seriously, is to be productive and giving members of the communities in which we live and work. 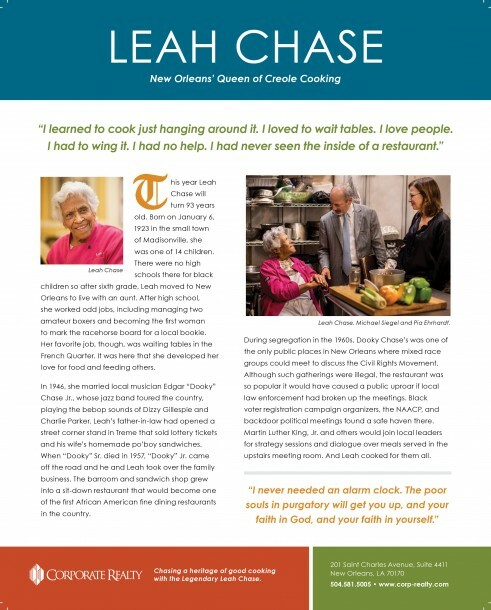 With this in mind, we hope you will enjoy this year’s monthly mailers that will have an overview of our transactions and new assignments every month along with observations from Ms. Leah Chase and interviews with community members who have been greatly influenced in their lives and work by her. Recipes will be favorites from the Dooky Chase Restaurant.